traditionally, early may resembles the best of summer in the hebrides. you can pretty much forget about july and august; may is usually where it's at. but that scarcely takes into account the latter part of may, when the whisky festival takes place. several years ago, while attempting to cover the festival for our local newspaper, i travelled across to the neighbouring planet of jura. though the day was bright enough, the wind was high and getting stronger. the chap on the jura ferry informed me that i ought best to be back at the slipway before 1pm, becasue they were likely to withdraw the service by that time. since i only required a few photos, i managed to cycle the eight miles to craighouse and back by 11am, after which, i sat in the waiting room at feolin until about 3:30pm in the afternoon. the combination of galeforce winds and strong tides meant that a berthing attempt by the small ferry around 2pm was totally unsuccessful and i was ever so glad that i hadn't been aboard on its return journey. fortunately, since i had originally been due to travel to one of islay's distilleries in the afternoon, i had taken some lunch with me, but as i munched on it in the waiting room, i was trying to think of anyone i knew on jura. at the time, it didn't look like i would be going home that evening. as it transpired, we all lived happily ever; the boat eventually arrived and i left jura behind on the other side of the sound. but the ride home was interesting. so despite claims of climate change and global warming, the hebrides seems inclined to ignore anything that's written in the newspapers. as, apparently, do the upper reaches of northern italy. those of you who subscribe to the highly esteemed rouleur magazine, will hopefully have read editor andy mcgrath's excellent feature on the chaps who keep the stelvio pass clear of snow when the giro d'italia comes to town. remember, just in case it had slipped your mind, that this is the month of may about which we are talking, one month shy of halfway through the year, yet the giro has had previous occasion to have mountain stages cancelled or altered due to more snow than 28mm rubber can cope with. a matter of thirty years ago, in the giro of 1988, andy hampsten became the first and so far, only, american to take the pink jersey to milan, but only after surviving horrendous conditions atop the gavia pass during the 14th stage of the race. according to hampsten, aside from the thickly falling snow, the temperature had dropped to minus five degrees. however, his cutoff temperature for training in the usa, had been minus six degrees, so carrying on was, in his mind, still a favourable option. though he didn't win the gavia stage, his finish-line placing did put him in pink as leader of the race. to commemorate this valiant fuflilment of rules #five and #nine, rapha have today released a gavia collection consisting of a blue, short-sleeve sportwool jersey, a waterproof, breathable race cape, an appropriately constituted winter cap, a baselayer resembling pages from gazzeta dello sport, a pair of classic bibshorts, the mesh portion of which features a similarly gazzetta decorated pattern, neoprene long-finger gloves and a rather fetching pair of socks. 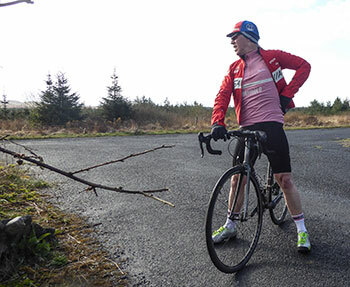 at the time of my review, the jersey was unavailable, but in light of windchill not a million miles from hampsten's gavia sojourn, i was more than happy to wear all of the other items in the collection without suffering from heat exhaustion. 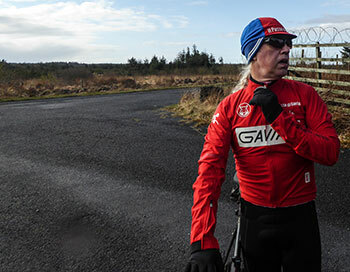 the gavia collection appears to have been designed with the hebrides in mind; though imperial works has been guilty of releasing diaphanous garmentage in the depths of winter, neoprene gloves, winter hat and race cape in may, is not the daft idea that it may seem. it's a pity that very few people will ever see the gazzetta decorated, mesh baselayer in action, for it is surely the most iconic piece in the collection. however, for the thusly dressed velocipedinist, simply knowing that it's there ought surely to be enough in itself? 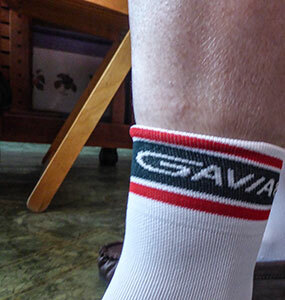 perhaps it would have demonstrated more sound judgment to have featured thermal bibshorts, but nonetheless, these classic bibs, with gavia88 writ large on the right leg, are every bit as good as ever they were. probably the highlight of the whole collection is the bright red race cape, constructed of a three-layer, stretchy, breathable fabric. with zipped, neoprene cuffs allowing it to be put on and taken off over the neoprene gloves, a cosy collar and drop tail, the word marvellous scarcely seems to do it justice. 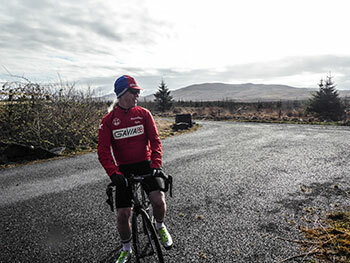 though the velo club peloton has recently graduated to standard casquettes, ostensibly for the summer (to which it is laughingly referred), the opportunity to revert to the blue and red gavia winter hat was a necessary luxury. though my garmin was keen to inform me that the ambient temperature was hovering close to eight degrees, it's a device that pays scant attention to any windchill. common consent had it closer to four degrees. 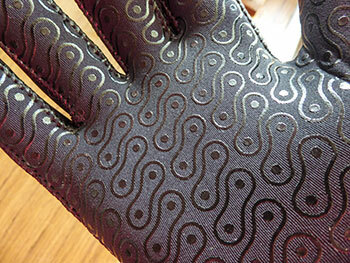 that would help explain why the neoprene gloves, with a chainlink pattern on the palms, simply leaned towards sweaty palms rather than all-out perspiration. aside from a timely reminder of andy hampsten's giro victory of thirty years past, this gavia collection from london's tileyard road consists of a superb set of garments, available separately or, if your bank manager is of an agreeable disposition, as a complete set. 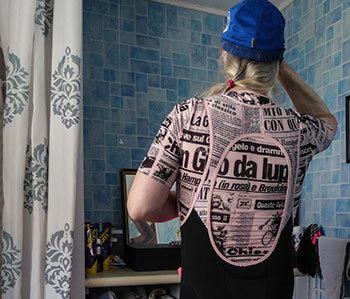 with the first of this year's grand tours commencing in the merest hint of time, there's no moment like the present to add to the cycling wardrobe. because you just never know what the weather's going to be like on islay or jura. the gavia s/s sportwool jersey is available in blue at a cost £155. 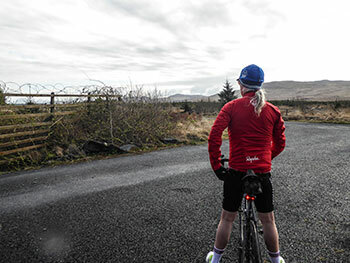 the race cape is priced at £250 and the gavia monikered classic bibshorts at £200. that totally desirable mesh baselayer retails at £55, while the neoprene gloves and socks cost £40 and £15 respectively. the best winter cap in the world bears a price tag of £50. all should be available direct from rapha, or from cycle clubs while stocks last.